As we begin our third year of restoration in North Beach Park, it’s nice to get an overview of what we’ve done so far. But first: Don’t forget the 4th Saturday Work Party, THIS Saturday, April 27th, from 9 a.m. to noon. We’ll meet at the main entrance to the park, 90th St. and 24th Ave. NW. We’ll provide tools, gloves, and guidance; you wear weather-appropriate layers that can get dirty, and bring snacks and water as you need it. Have a question? Email lukemcguff@yahoo.com or leave it in a comment here. Now back to the statistics. If anything, these numbers are low — I know I’ve sometimes skipped reporting some work I’ve done, and that sometimes planting parties don’t quite count accurately. First work party (photo by Drexie Malone). Since we began, we’ve had 53 “work log events” — which includes school groups, work parties, and the days when a couple of the forest stewards got together to hang out. This accounts for 379 adults and 165 youth, for a total of 1276 hours. 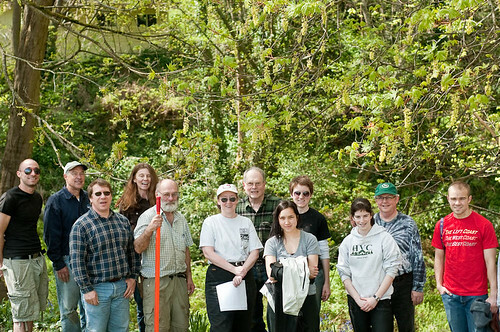 And let’s not forget the 16 paid staff, for 48 hours — they do work that volunteers can’t, such as clearing fallen logs and removing woody invasives. 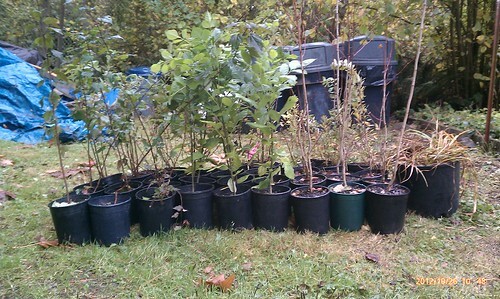 We’ve planted more than 322 trees (conifer and deciduous), 189 shrubs, and 125 herbaceous plants; in many cases, these were native plants reintroduced to the forest. We’ve greatly increased the diversity of native plants, while we’ve been DEcreasing the diversity of the invasives. 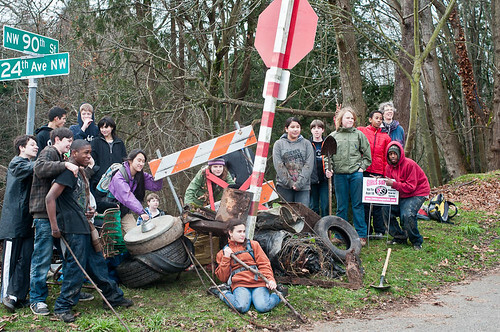 The first planting party was March, 2012. That’s pretty late in the planting season, but we had a long, cool, wet spring that year, which gave the plants plenty of time to establish before the long drought later that summer. This meant we had a pretty good establishment rate — lots of those plants are rebudding quite prettily. One statistic that doesn’t show up in the report is the number of survival rings we’ve put around trees that are being choked by ivy. 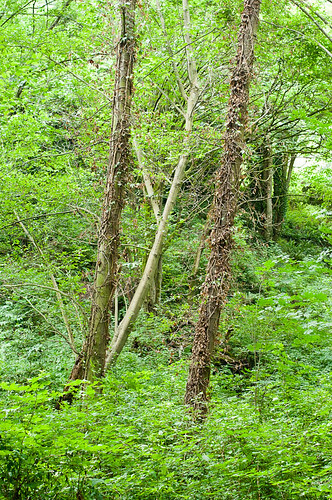 A “survival ring” involves cutting through the ivy roots at about four feet off the ground. The roots above the cut are left in place; they’ll die. The roots below the cut are pulled back off the tree, and pulled up from the ground as much as possible. If it’s feasible, a 6′ ring is cleared (and then mulched) around the tree. The Ivy Ring Crew has removed ivy from more than 50 trees. This is sometimes quite an arduous process; it’s the hardest physical job we do in the park — other than hauling out large trash items. This is my favorite picture of a trash pile. No, the kids aren’t trash. They’re an 8th grade class from a University District alternative middle school. This was the largest single trash pile we got out of the park, and it includes tires, wheels, shopping carts, bags of cans’n'bottles, and more. It was large enough for more than 20 8th graders to pose on, after all. Other notable finds have included water heaters and oil tanks, a vacuum cleaner, a washing machine body, a couch, a playhouse for dolls, and tires. Lots of tires. In a more densely populated area of the city, the trash would have been much higher. The amount of trash that comes out of the park on an average work party is visibly decreasing. We used to send groups into the park just to get trash; nowadays we might not find anything. All this is just “a good start.” There are still many trees with ivy growing up into their crowns, still lots of blackberry, still plenty of areas of the park we haven’t gotten to — and might not for a few years. The work is great fun, and we hope you can join us. It’s physically demanding and psychologically rewarding. Plus, shared work is a great way to meet people. If you can’t make it to North Beach Park, go to Green Seattle Partnership’s website and find an event near you.